The mainstream media and Wall Street have reached the consensus that the current credit crisis is the worst since the post-war period. George Soros’ statement that ”the world faces the worst finance crisis since WWII” epitomizes the collective wisdom. The crisis is currently the ultimate scapegoat for all the economic evils that currently plague the global financial system and the global economy – from collapsing stock markets of the world to food shortages in third world countries. We are repeatedly assured that the ultimate fault lies with the Credit Crisis itself; if there were no Credit Crisis, all of these terrible things would never have happened in the economy and the financial markets. The most extraordinary thing is that the mainstream media has never attempted to compare the current economic environment to that preceding the Great Depression. It is assumed outright that the Great Depression could never happen again, thus obviating the need for such a comparison. The macroeconomic fundamentals today are much worse. We are in for a protracted period of economic depression – a depression much worse than the Great Depression, a depression that would likely be remembered in history as “The Second Great Depression” or The Greater Depression, as Doug Casey has called it so aptly. Here is why I believe that this is the case. Asset Bubbles – first in the stock market during the 1990s, then in real estate during the 2000s, pretty much mirroring the stock and real estate market bubbles of the 1920s. Securitization – although not in the very “ultra-modernistic” form and shape of the 2000s, with slicing and dicing of pools and tranches of seniority, it was widely recognized in the 1930s that securitization during the 20s drove the domino effect in the U.S. financial system during the Great Depression. Excessive Leverage – just like in 2008 the topic du jour is “deleveraging”, so the unwinding of leverage during the 1930s was the driver of forced liquidations and financial pain. Of course, it was very clear back then that the root of the problem was not deleveraging per se, but the excessive leverage that took place prior to the deleveraging process. “Investment Pools” were then instrumental in both the securitization and excessive leverage, just like the Hedge Funds of today. Corrupt Gatekeepers – we know well that the Enrons and Worldcoms were aided and abetted by the accounting firms – those same firms that were supposedly the Gatekeepers of the financial community, yet handsomely profited from the boom while neglecting their watchdog functions. In the current financial crisis, we also know that the rating agencies were also making hay during the boom. Very similar were the issues during the 1920s that led to the establishment of the SEC and other regulatory bodies to replace the malfunctioning “gatekeepers” at the time. Financial Engineering – we are led to believe that financial engineering is a rather recent phenomenon that flourished during the New Age Finance Era of the last 15 years, yet financial engineering was prevalent in the 1920s with very clear goals: (1) to evade restrictive regulations, (2) to increase leverage, and (3) to remove liabilities from the books, all too familiar to all of us today. Lagging Regulations – just like the regulatory environment lagged the events of the 1920s and regulations were introduced only after the Great Depression had obliterated the U.S. financial system, so we are yet to see new regulations addressing the causes of the current crisis. Understandably, regulations should have foreseen today’s financial problems and should have been introduced before the crisis. Market Ideology – back in the 1920s, just like in the last two decades, the market ideology of “laissez faire”, which Soros quite appropriately described as “Market Fundamentalism”, has swept the financial markets. Of course, the free market knows the best, but the reality is that the money market is not really free – when the Fed determines the cost of money (interest rates), and can fix this cost for as long as it wants, then all sorts of financial imbalances can be sustained without the discipline imposed by the market. This can lead to all sorts of problems that we actually have to face today. Non-Transparency – back in the 1930s, it was widely recognized that businesses and especially financial institutions lacked transparency, which allowed for the accumulation of significant imbalances and abuses. Today, financial markets and institutions have intentionally compromised transparency in a number of ingenious, or better disingenuous, accounting trickeries and financial gimmicks, like off-balance-sheet entities (SIVs), hard-to-understand derivatives, and opaque instruments with mind-boggling complexity. Today CEOs and Chief Risk Officers of major financial institutions cannot figure out their own risk exposures. Originally, lack of transparency was designed to fool the markets; ironically, modern-day financial executives have gotten to the point of fooling themselves. So, why Worse Than The Great Depression? What makes me believe that the current depression will be worse than the Great Depression? I present six of the most important fundamentals that are “baked in the cake” and that suggest of a Greater Depression. The best way to think about leverage is to compare it with using drugs, while deleveraging is like detox. The problem is not that the detox is killing the patient who has abused drugs for years; what is really killing the patient is the drug abuse itself. However, one thing is clear – the patient must either go through a painful detox or die; the same applies for the financial system – it must either deleverage or implode. The chart below shows an even more telling picture. It shows world GDP and world’s notional value of derivatives. 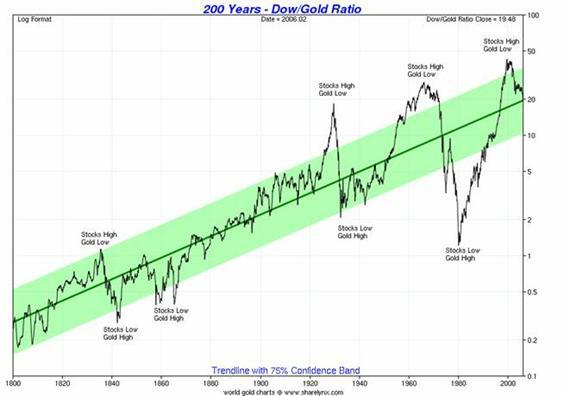 Again, while there is no direct comparison with the 1920s, it is clear that the overall level of derivatives has skyrocketed during the last two decades and presents risks that were simply not present at the onset of the Great Depression. 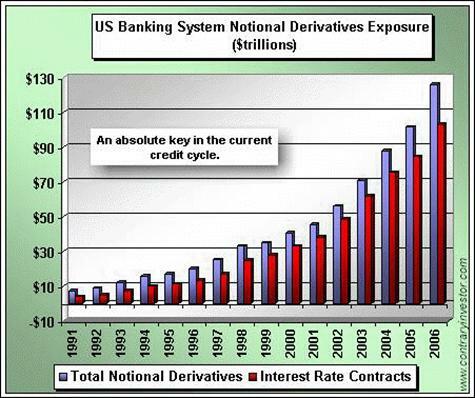 The unwinding of these derivatives could only be compared with a nuclear explosion in the financial system. A caution on terminology is necessary here. While the literature over the last 10-20 years has widely recognized the term “Bretton Woods II”, in September-October of 2008 the term was widely used by the media to describe a proposed international summit with the goal of reconstructing a new international monetary system designed from scratch, just like “Bretton Woods”. Instantly dubbed by the media “Bretton Woods II”, this term could be potentially very confusing as it could mean very different things to different people. The interested reader should consult Wikipedia’s Bretton Woods II where both meanings are explained in detail. 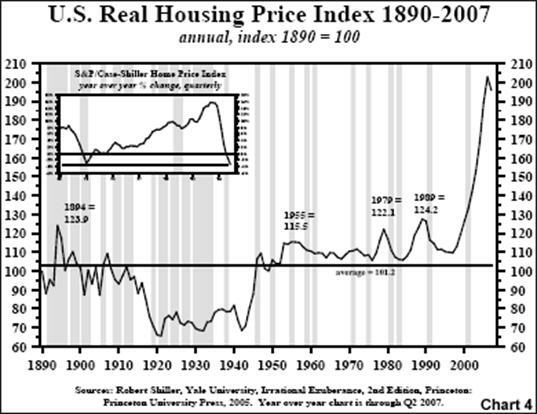 Based on indicators like (1) global real estate overvaluation, (2) indebtedness, (3) leverage, (4) outstanding derivatives, (5) global bubbles, and (6) the precariousness of the global monetary system, I would argue that the accumulated imbalances in the current period surpass significantly those preceding the Great Depression. I therefore conclude that the coming U.S. (and possibly) global depression will be of greater magnitude than the Great Depression of the 1930s. It likely suggests that we are entering a historic period that will likely be known as The Greater Depression. Krassimir Petrov holds a Ph.D. degree from the Ohio State University in Economics (1999). During 2000-2004 he worked at Sterling Commerce, a subsidiary of SBC Communications. He is Assistant Professor, The American University in Bulgaria teaching Macroeconomics, Money and Banking, and International Finance. Since 2007 Dr. Petrov contributes a newsletter for Agora Financial.